Wow, what a busy time it’s been lately. 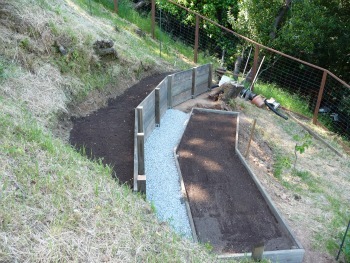 I’ve been moving and building planting beds for my new veggie garden as well as all the usual stuff….lol. Sometime you just wonder where the time goes. But I feel it’s better to lead a full life, with plenty of time for rest and recovery, rather than be idle. People who know me and long time readers of Vibrant Living know I am big on veggie gardening and encourage everyone to get out and play in the dirt. In this issue of Vibrant Living I’m going to share some thoughts and ideas for doing just that. I have another seasonal recipe that is so simple, yet satisfying beyond belief, and a couple of short news stories on health related topics. Enjoy! A quick heads up for you folks interested in attending the 3rd Annual Raw Health Expo on July 23 and 24 in Sebastopol, California. Head on over to rawhealthexpo.com for more details and to get your tickets. Gretchen and I will be presenting again this year and look forward to seeing many of you there. There are many raw events around the country, and the world for that matter, but what separates this one from the rest is the focus on a HEALTHY raw lifestyle. If you want great results from the raw food diet, meet with the folks getting those great results long term. Hope to see you there and chat with you in person. Here’s another new recipe from Gretchen. •	Sunlight makes fruits, vegetables, and grains grow healthy, and in the same way makes animals and us humans grow and develop healthy and happy. •	Natural sunshine gives us a healthy looking complexion, making our skin smooth with an irresistible healthy glow! •	Regular exposure to sunlight protects our skin, as our body builds up a natural resistance to harmful effects of UV light. •	Moderately tanned skin is more resistant to infections and sunburns. •	Ultraviolet rays in sunshine act as natural antiseptics, killing viruses, bacteria, molds, yeasts, fungi, and mites in the air, water, and on different surfaces, including on our skin. •	Sunshine clears up skin diseases such as acne, boils, athletes’ foot, diaper rash, psoriasis, and eczema. •	Sunlight stimulates our appetite and improves digestion, elimination, and metabolism. •	Daily sunshine enhances the immune system, increasing the white blood cells in our blood making them better at destroying germs. •	Sunshine stimulates healthy circulation and the production of red blood cells increasing oxygen in our blood. Sunlight is one of the most effective healing agents that exists. I’ve always had an immense desire to grow my own food. Perhaps it’s because when I was growing up we always had a large veggie garden, at least until we moved in my Jr. High days, and then we had some small plots here and there that were always planted. When I struck out on my own I just about always had a large veggie garden myself. There’s just something magical about putting seeds in the ground and seeing food grow before one’s very eyes. Years ago when I was logging I would come home and grab the salt shaker off the table and a beer from the fridge before heading outside to eat the luscious fruits of my labor. In recent years I’ve played that scenario out many times, minus the salt shaker and beer that is. When preparing my morning smoothie I head out to pick fresh greens and herbs and later in the day return to gather greens for a salad. During the summer and fall I may just eat tomatoes and cukes right off the plant, chewing on a few greens here and there, before enjoying an avocado. 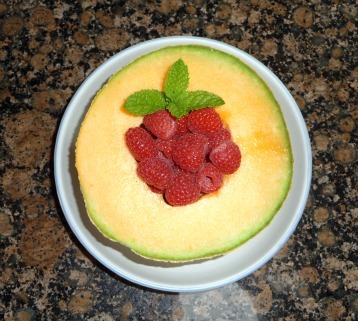 So simple and satisfying, loaded with nutritional value, and no messy dishes to clean…ah the true beauty of raw foods. I’ve read that a head of lettuce loses half its nutritional value in the first 24 hours, and if that’s so then eating fresh from the garden is an amazing step up in the realm of nutrition and of overall health. I’ve shared with people for years now about the super feeling I experience during the time of year I’m able to eat a majority of my food directly from my garden. It’s a feeling of immense good health and vibrancy, a feeling that you could conquer the world if need be. In essence it’s the way we should be feeling all the time. For years I have had the desire and goal to grow 95 % of my own food. I think it’s only natural, and will provide me with continued good health and stamina for many years to come. Thankfully Gretchen shares this desire with me so we have been researching locations that would enable us to fulfill this goal. Hopefully it will happen soon, but due to circumstances like jobs and children it may take more time than we would prefer, but the universe is perfect and it will happen at just the right time for us. Meanwhile we’re making the best of our situation here and now. Our backyard is quite steep so we’ve terraced portions to put in veggie planters and interspersed fruit trees and raspberry bushes on the slope, all connected by small trails and steps. It wasn’t the easiest project to take on, but we both feel so strongly about being in control of our food supply, that we happily took it on. One of our raised beds is actually part retaining wall, part raised bed, and so is more complicated that most raised planters will be. Actually all you need are some boards, we used 2” x 12” fir that we treated with an environmentally safe stain called ECO Wood Treatment ordered from Canada over the internet. You can set 4” x 4” posts, use metal fence posts, or just sharpen 2”x 4” stakes and drive them into the ground to hold your boards in place. Don’t use any store bought treated lumber as it’s quite toxic and will bleed into your topsoil. At my last garden I just stacked up rocks and broken concrete chunks for the border. And of course you can always use containers or plant directly in the earth. If you have moles or gofers where you live, putting down wire mesh or hardware cloth would be a good idea. Raised beds allow for the soil to be warmed during the day which means better results for the plants, and also less bending over. Plants do much better when they don’t get too cold during the night so anything you can do to keep that from happening will help. That’s the principle behind the greenhouse; keep things climate controlled and steadily growing. Building the soil is very important which is why I recommend using organic topsoil if you have to purchase it. You can build up your own soil with compost, worm castings, rock dust, straw, alfalfa, mulch and just about anything else that adds nutrients, but nothing with mature seeds. Burying a layer of straw and or alfalfa 12” to 16” deep will provide great compost and as it decomposes it creates heat as well. Once the soil is in you can plant seeds which is far more economical that starters, but does take more time to see results. I usually buy starters for tomatoes and cukes and plant everything else from seed. Watering, particularly when seeds are in the ground or when small plants are visible, is very important. I know this seems like a no brainer, but putting off watering during hot weather may cost you precious plants from your food supply. Watering in the early morning is best because you’re not cooling off the warm soil, later in the day or evening is probably next best. If the idea of constructing planter beds seems daunting, then get some help. Make a day or afternoon out of it with a raw food picnic, kind of like an old fashioned barn raising. 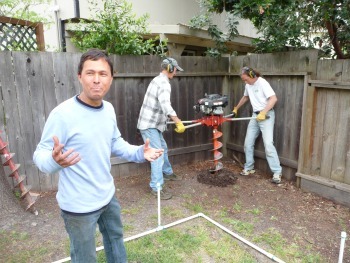 Several weeks ago we helped our friends Rick and Karin Dina dig about 30 post holes for their new raised planter bed. Rick had rented an auger and he and I went to it, and had all the holes dug, roots and all in about 1 ½ hrs. Gretchen helped keep us lined up and Karin was cleaning out the augured holes. John Kohler was there filming for his blog post on gardening and a few good laughs were had by all as the work was accomplished in very good time. Afterward we enjoyed green smoothies with greens fresh from the existing garden bed. There are many good books available on gardening and of course today there is a lot of info on the internet, but to tell you the truth it’s so darn easy to grow stuff. I’ve always had great crop yields and when I started I never had a clue about what I was doing. I planted and watered, and when the weeds got too tall I picked them. Look around you, when it rains the plants grow. Each year I plant what I know will grow well, and then experiment a little with other crops I’m not sure about. Sometimes those crops produce and sometimes they don’t. I don’t get discouraged, this is just the way of nature and we have to abide by nature’s laws and reap those crops that grow the best in our particular micro climate. I live just north of San Fran now and I have great luck with collards, kale, bok choy, tatsoi, spinach, lettuces, basically most greens, tomatoes and cukes. I always grow a large quantity and variety of greens, tomatoes and cukes, then experiment after that. I find in this climate I can grow most greens all year long, which is wonderful for us as we’re really big on the greens. When you begin to harvest food you’ve planted yourself and taste how amazing it is you’ll be hooked on growing your own and will be doing amazing things for your health as well. Young kids love to plant seeds and see things grow. I remember how proud and excited my girls were when we started eating the carrots they helped plant from seed. It’s a great way to get your kids thinking about food and where it comes from, the importance of good nutrition, and being able to provide for oneself. I do hope I’ve inspired you to try a little gardening in the raw, and for those of you already enjoying the fruits of your labor I’d love to hear from you. Please share with us any tips you’ve learned and what works where you are. And remember, every one of us has a green thumb; it just takes a little practice before it’s fully evident sometimes. Council of Europe committee examined evidence that the cell phones and wireless internet connections have "potentially harmful" effects on humans, and decided that immediate action was required to protect children. They ruled that the technologies pose a health risk and should be banned from schools.